For the second consecutive year, on July 12, the Neighbourhood Police Station 9 held a “Harley Davidson BBQ and Bike Rodeo” at Fletcher Park in Côte Saint-Luc. 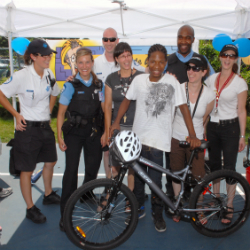 Over 100 youth participated in this event, which was held in collaboration with “Harley Davidson” Moto International Montreal, Côte Saint-Luc Public Security, the Montreal Children’s Hospital Trauma Centre, the Volunteer Citizens on Patrol, Côte Saint-Luc Emergency Medical Services and the Motorcycle Unit of the SPVM. During this activity, the youth participated in workshops on bicycle safety in order to raise awareness of important road rules and traffic signs. The trauma coordinators from the Montreal Children’s Hospital Trauma Centre of the McGill University Health Centre were on hand to demonstrate the importance of protecting their brains by wearing a helmet during wheeled sports activities. A free lunch was provided to the children courtesy of Moto Internationale Harley Davidson. Additionally, raffle prizes were drawn, including a bicycle, skateboards, helmets and KIF-KIF t-shirts from the SPVM sharing the road program, all courtesy of Moto International, the Montreal Children’s Hospital, the SAAQ and the SPVM. This event had the dual role of teaching the children about safety and prevention and also allowing them the opportunity to meet the different stakeholders in a friendly environment. We are very pleased with the success of this event and sincerely believe that we were able to increase awareness regarding the important of wearing a helmet in order to reduce the risk of serious injuries while playing sports!